Dems To GOP: Show Us Your Health Insurance : Shots - Health News A bill introduced by House Democrats would require members of Congress to declare whether they are taking health benefits subsidized by taxpayers. The bill has next to no chance of passing because Republicans control the House. But its introduction puts some heat on the GOP. With Republicans on Capitol Hill still trying every legislative manuever they can think of to undo last year's health law, it was probably only a matter of time before Democrats tried a gambit of their own. Now a House bill being pushed by Democrats would require Republicans to publicly state whether or not they are accepting taxpayer-subsidized health benefits under the Federal Employee Health Benefits Program. They're entitled to such coverage as members of Congress, but Democrats say it's hypocritical for Republicans who are voting to take health coverage away from millions of Americans to accept coverage subsidized by those same people. By pushing a repeal of the big federal health law so hard, Republicans have "made it clear that they were OK with millions of Americans going without health insurance or struggling to find affordable health care," said Rep. Linda Sanchez (D-CA). "What Republicans didn't make clear is that they, on the other hand, were OK with receiving government-subsidized health care benefits." The bill doesn't actually require anyone to take or not take the benefits. It simply requires the decision to be made public. The bill has next to no chance of passing because Republicans control the House. But its mere introduction puts some heat on the GOP. It's a further escalation of efforts that began in December, when Democrats pushed incoming GOP freshman who ran on a platform of repealing the health law not to accept their government health insurance. The taxpayers are our employers. They contribute to our health care coverage and they deserve to know which members are keeping taxpayer-subsidized health benefits for themselves and their families, while they vote at the same time to deny those very same benefits and rights to all American families. According to The Hill, a Capitol Hill newspaper, more than a dozen of the 87 House freshmen have declined to accept their federal health benefits. 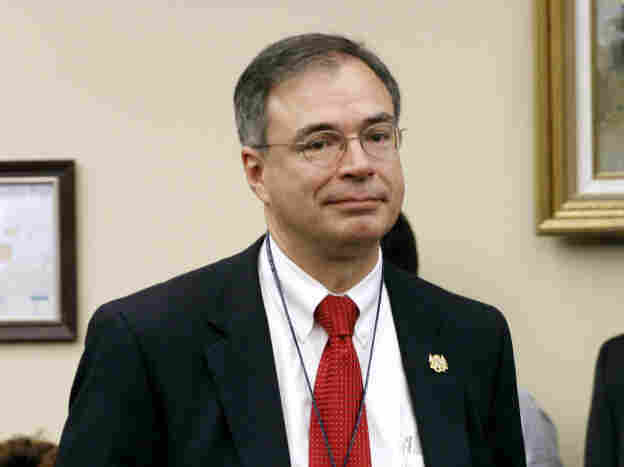 That bunch includes Rep. Andy Harris (R-MD), an anesthesiologist who is technically on leave from his post at Johns Hopkins. Harris, in case you forgot, sparked the entire episode when he complained at an orientation session about how long it would take for federal health benefits to kick in. Harris, it turns out, is keeping his family's health benefits from Hopkins.